When muscle cramps strike, what do you do? When painful barriers arise in your life or career, what do you do? I cracked the code on overcoming leg cramps on a long hilly trail run (aka Belief Energy And Motion or BEAM) today. I hadn’t run a long hilly distance in a few weeks until this morning. Family fun, LinkedIn and the Belief Energy conversation have had me surging exhaustively in recent weeks. Two of these fulfilling callings have had me at a computer more than in the woods. At the turn of my third hour running on the Dipsea trail (one of the word’s finest trails) my salt and hydration levels were low and quad cramps came on strong. “Cardiac Hill” (aptly named), the trail section I was on when cramps struck, is always challenging. It’s especially daunting when half your leg muscles are on strike. I had six or seven miles back to my destination in Stinson Beach where my friends were waiting with beers and grilled meat. I had to make it, but I was shallow breathing, contracting and both inner quads were flinching and screaming like like they’d been pierced with burning crossbow arrows. Where can I flag a car to hitch a ride down the hill? Did I go too big with almost a month off? Will my family and friends be inconvenienced? My thoughts were multiplying like flames flashing up a stream of lighter fluid toward the can…and my arm…Yikes! After multiple brain-based Man of Action solutions failed, my soul delivered some sanity. I sat at the trail side for a Rest. Fuzzy forms of fellow trail runners bounded past me in the dense Pacific fog. After a few minutes of misty silence at my “Hogsback Rise” rest stop my heart rate fell a few dozen beats per minute. I trained my inner focus on my breath. I took deep expanding breaths. I visualized fresh cool oxygen spreading from my core to my throbbing quads. Not only had the breathing and visualization settled my negative thought spiral, they had loosened the the knots in my legs and brought my optimism level back to its typical lofty height. A couple easier miles later I stopped to appreciate the redwood grove I was gliding through. I love it when I remember to pause, feel and love. My breathing was still deep and energy surging. My cramps were in the rear view mirror thanks to my transition from thinking to living. 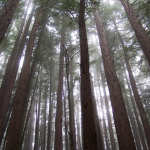 I paused and stared up into the redwood canopy hundreds of feet overhead. The sweet cool fog blew against my muddy sweaty skin. Refreshing spiraling rain drops fell on my face. I lowered my glance from the soupy heavens to the trunk of a massive redwood tree standing two feet from me. Cool beads of water and bright green fuzzy moss filled deep folds in its spongy brown bark. It was a moment of perfect living vs. thinking. I felt connected, whole and Home. Forty five minutes later I was among friends at the beach and cramp free. I was smiling, laughing, sharing stories and breathing deep. I could hear the waves. Goose bumps rose on my neck as my taste buds collided with a delicious post run meal. Pay respect to the pain-based learning opportunity. With mind and soul. Relax my fearful mind (After all, muscle cramps and other painful barriers crumble in time). Stay the course or change it. Give it time, you’ll know which to chose. EXPAND vs. contract when facing adversity. Try to remember that painful barriers are always more short-lived than my brain wants me to believe. Visualize a resolution with my mind, but let my soul participate in the solution. Work to remain rooted in soul even after the painful barrier is behind me. Assignment: Next time you face physical pain or life throws a painful barrier in front of you, try applying some of the above. Journal about it. Discuss it with a friend and ask others how they overcome painful barriers. Share what you learn on the Belief Energy facebook page. This entry was posted on August 21, 2011 at 7:13 AM and is filed under Belief Energy, Man of Action. You can follow any responses to this entry through the RSS 2.0 feed. Bryan – you really have a gift for writing. Thanks for sharing more of your adventures. While I wish I could have been there on the adventure with you boys, I feel almost as if I had been while reading your post. I’ll keep those lessons in mind during the 104 mile team mountain bike race I’m doing next weekend! !